With a blistering 0-62 mph time of 3.4 seconds, it’s incredible to think that the entry-level 570GT is one of the slowest cars in McLaren’s line-up. Its speedy sports car performance is combined with sumptuous comfort and practical storage space, making the 570GT an ideal daily driver. After sprucing up the 570S, renowned tuner Novitec has transformed the 570GT with a slew of modifications that brings more potent performance, racier looks and even more agile handling. Novitec has developed three performance kits for the 570GT, each of which can be activated with the touch of a button on the Active Dynamic Panel. The most powerful performance stage uses new engine mapping and a high-performance exhaust system to boost the power output by 76 hp. As a result, the McLaren 570GT’s 3.8-liter twin-turbo V8 now pumps out 646 hp and sprints from 0-62 mph in 3.0 seconds before maxing out at 208 mph, which isn’t much slower than the mighty McLaren 720S. The upgrade also makes the throttle response more agile for a more engaging driving experience and provides a more powerful performance curve across the entire rev range. Complementing the performance upgrade is a high-performance exhaust available in either stainless steel or Inconel, a lightweight material used in Formula One racing. The bodywork has also received an extensive upgrade, with aerodynamic-enhancing exposed carbon fiber parts that give the practical sports car a far racier look. A new front spoiler gives the mid-engined sports car a more striking appearance, while a rear airfoil further improves the handling stability at high speed. 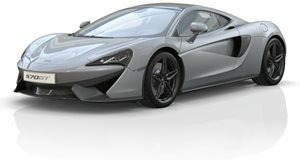 Rocker panels make the 570GT appear longer and lower to the ground from the side, and the air intakes now have carbon fiber covers that further improve the air flow. Completing the exterior enhancements are lightweight Novitec MC1 wheels featuring five double-spokes comprising of a 20-inch set at the front and a 21-inch pair at the rear. Customers will also be able to personalize the cabin with a comprehensive choice of high quality leather and Alcantara materials in any desired color.